The convention has started off extremely well. My first playtest session was scheduled for 3:00pm Most games in this block started at either 2 or 4, so I was worried that mostplayers would be in the middle of a game. However, the flip was also true, players who has missed the 2pm starts had fewer choices. 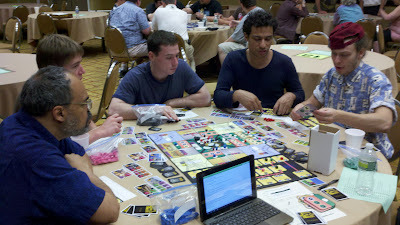 One group that was looking for something to play at 3:15 saw Titans of Industry set up and liked my elevator pitch. 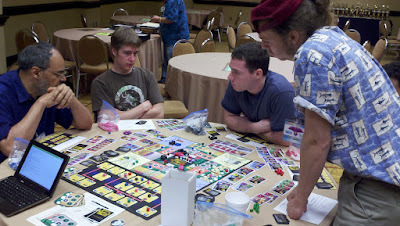 So I met my primary goal for this convention: get a playtest of Titans of Industry with a full five new players. It took about 10 rounds for the game to finally click and there were a few rules questions. 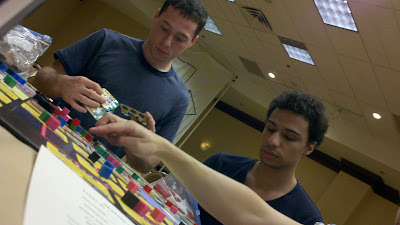 Nonetheless, the players were extremely positive about the game, even before they found out it is only a prototype and I am the designer. That is a good sign, they liked it even when they thought I was merely a random GM. They gave good feedback; some of which I incorporated mid-game. Here are my notes from the test. can you choose the bank over a player? After the session, I had originally planned on playing in Fresco at 8, but I was a tad mentally fatigued (as well as hoarse from explaining rules in a loud room), so I decided to just relax until my Municipality playtest at 10pm. When the ten o'clock session rolled around, no one showed up for Municipality. While not a perfect way to end the day, I am okay with it. I got a great playtest earlier for my most important game, so I'll go to bed happy.